Mark Vincent is the only classical artist in Australian history to have released 6 albums by the time he was 20… and sold in excess of 500,000 albums…. The young 15-year-old boy that burst onto our screens with his mind-blowing rendition of Nessun Dorma on the channel sevenʼs Australiaʼs Got Talent back in 2009 has established himself. Where once there was a shy boy, there is now the subtle, fresh confidence of a young man with a slight swagger to his step. Yet he exudes the same humility, which has won him legions of passionate fans. It’s this constant young- yet-mature juxtaposition that defines his unique character, and has seen him release six albums in his short yet hugely successful career. Album number six – entitled ‘Best So Far’ (released May 2014) is a stunning collection of classic and contemporary songs with a unique Mark Vincent interpretation. His first album ‘Mio Visione – My Dream’ reached #2 on the ARIA album charts, followed by ‘Compass’, ‘The Great Tenor Songbook’ and then ‘Songs From the Heart’, which went Gold and charted #5, #18 and #10 respectively on the ARIA album charts. To date his total albums sales are over half a million worldwide. Completing his HSC in 2011, Mark has embraced tertiary studies whilst continuing his recording and performing career. Mark is a full time student at the Australian Institute of Music where he is studying everything from song writing to dance. He has found a new passion for musical theatre and hopes to branch further into that world. Yet his feet are still firmly on the ground. His heart always connected to his much loved family and genuine affinity to his fans, which is endearing and true. Despite the success of his six albums, Mark declares his favourite pastimes to be simple ones: hanging out with his buddies, enjoying the company of his close family. And of course, singing. Always singing – his first, last, undying passion. It’s something stamped in his DNA, the blueprint to his life. “Music is in me. You know, when you’re born with something inherently in you? I think we are all born with a voice capable of singing, but not everyone has it in them to use it. “I grew up listening to all the beautiful arias, and I feel that when I sing, I really am the happiest guy on earth. All my troubles are gone. And you know, many people have a great voice, an exceptional voice even, but what’s missing is the storytelling. It’s not just about singing notes it’s always, always about telling a story”. Mark’s own story remains a remarkable one. The Sutherland Shire-raised young man won the third series of ‘Australia’s Got Talent’ in 2009 (an experience he has described as “surreal, amazing”) and soon he was signed to the Sony Music record label – and the world really sat up to take notice. His first album ‘Mio Visione – My Dream’, captured the hearts of many and he has continued to do so with his following four albums ‘Compass’, ‘The Great Tenor Songbook’, ‘Songs from the Heart’, ‘The Quartet Sessions’ and most recently ‘Best So Far’. In amongst all that he has appeared on stage alongside Whitney Houston, Katherine Jenkins, The Priests and Kate Ceberano. For his fifth album “The quartet sessions” Mark again teamed up with conductor/producer, friend and mentor Chong Lim. This time backed by the glorious sound of a string quartet. “A lot of the songs we were doing were written for forty piece orchestras; they’re big songs. Chong and I had to find a way to adapt them for four string players”. The end result is a collection of songs that have the ability to resonate amongst generations; it’s exactly what Mark aimed to achieve. “I say to people of my generation – give this music a chance, because you will be surprised at how it can move you, speak to you. These are songs which have the ability to transcend several generations, and their lyrics are simply timeless”. His star continues to rise – indeed, it seems it is only the start of his stratospheric ascent. On his current album ‘Best So Far’ he once again showcases his singing talent. His voice has a depth and clarity, which belies his years; songs that appear on the album such as the beautiful rendition of ‘Besame Mucho’ and ‘You Raise Me Up’ clearly illustrate this and truly showcase his innate, God-given gift. ‘Best So Far’ is a collection of enduring classics (including ‘Ave Maria’ and ‘Hallelujah’), tracks from iconic musicals such as Jekyll and Hyde and Phantom of the Opera. For Mark, singing a collection of classics and contemporary songs was aimed to inspire a youthful audience. And then, of course, there is Mark the performer; The ultimate showman, the consummate professional. His utter ardour for connecting with the people he is performing for – you get a sense it’s what he lives for. “When you’re in front of an audience, they’re silently cheering you on, and your adrenaline is through the roof”. Indeed, standing ovations are commonplace at a Mark Vincent show. “I am emotionally connected to each of the songs I sing, and at a recent show I sang ‘My Way’ – just introducing it to the crowd moved me to tears. The audience stood and cheered, which moved me even more. A producer once told me that a standing ovation should be taken all in, enjoyed in the moment. And that’s what I did. I was told later it was the way I sang the songs, which told that story. I think that’s what singing is all about. Making people think. Bringing a tear to their eye. I always feel twenty kilos lighter after belting out a tune. Singing, for me, is like therapy. And likewise, if I’m down I’ll put on a song. It’s beyond uplifting – it’s what keeps me going”. Mark has been performing at the spectacular Carols in the Domain for seven years to a live audience of over 60,000 and a television audience in the millions. His outstanding tribute to the victims in the 2014 Martin Place Seige was highly accredited. 2015 saw him sing an amazing rendition of ‘The Prayer’. Mark has recently released a Duets Album with Marina Prior titled ‘Together’. Currently sitting at #5 on the Australian national Chart and #1 on the classical chart (4 weeks in the top 10 / 4 weeks at #1 on the classical charts). Mark and Marina will be touring with 6 shows across Australia later on in the year. Mark has also been personally selected by Julie Andrews herself to star in the Australian stage musical of My Fair Lady. Mark will be delivering his performance on stage from the 22nd of August! And continuing to deliver is what Mark Vincent will continue to do. To carry on gracing the world with his dulcet tones, to keep showcasing old school classics laced with the Mark Vincent slant. It’s what he wants; it’s what his fans want. 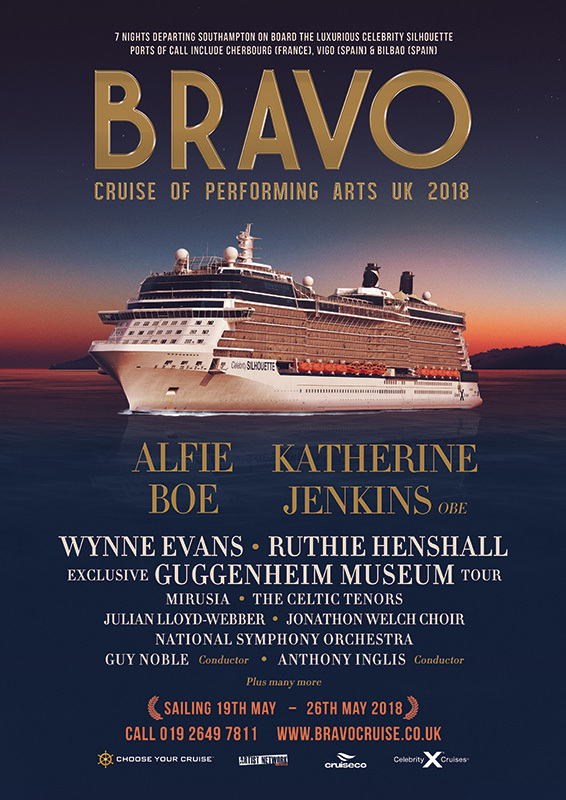 And Mark Vincent – with the world at his feet – is ready for BRAVO UK 2018!